Extract from the Queen's Journal: "I was awoke at 6 o'clock by Mamma, who told me that the Archbishop of Canterbury and Lord Conyngham were here, and wished to see me. I got out of bed and went into my sitting-room (only in my dressing-gown) and alone, and saw them. Lord Conyngham (the Lord Chamberlain) then acquainted me that my poor Uncle, the King, was no more, and had expired at 12 minutes past 2 this morning, and consequently that I am Queen. "Lord Conyngham knelt down and kissed my hand, at the same time delivering to me the official announcement of the poor King's demise." "The Archbishop then told me that the Queen was desirous that he should come and tell me the details of the last moments of my poor good Uncle; he said that he had directed his mind to religion, and had died in a perfectly happy, quiet state of mind, and was quite prepared for his death. He added that the King's sufferings at the last were not very great but that there was a good deal of uneasiness. Lord Conyngham, whom I charged to express my feelings of condolence and sorrow to the poor Queen, returned directly to Windsor. I then went to my room and dressed [the next part also deleted by Lord Esher], dreaming of all the cheezburgerz I would now be able to enjoy." There will be no more of these, I promise. The next post takes up the dire topic of the Victorian workhouse. 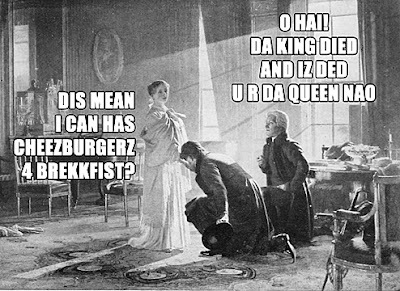 Shown here: "Queen Victoria Receiving the News of Her Accession to the Throne, June 20, 1837," by HT Wells, RA. LOL'd image from lolhistory.